This family demonstrates how much movement and interaction there was between the families in SOM and GLS. Thus far, this family is separate from another large THOMPSON family in/of Hawkesbury, GLS. With the collective efforts of a group of cousins (met as a result of researching) and many others, the Bitton and PublowTHOMPSON families are now recognized as one large family, documented back to the children of John/Abigail baptized in Redbrook, Newland, GLS starting in 1686. They were closely associated with the COSTER copper mills, and the migration of the family follows the opening of the mill in Swinford, GLS and then Bye Mill, Publow and Pensford, SOM in the early 1700s. 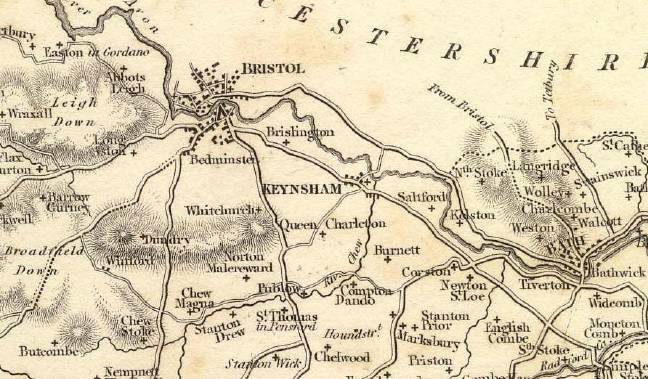 Part of Somersetshire from Samuel Lewis' Topographical Dictionary, c. 1835, showing Publow, Pensford and Stanton Drew. We have a marriage allegation, 1709, Newland, GLS between John THOMPSON and Anne COSTER (both aged 22 and of Newland, GLS). This is eldest son, 1687 John, but we have not been able to place Anne within the COSTER family. One of their known children was another John, bap 1710, Newland. We have recently learned of a 1735 lease for the Manor of Pensford Bisse, of "John THOMPSON of Stanton Drew, Somerset, copper forger." Two of the three lives in this 99-year document are "John Thompson aged 20 years or thereabouts, & James THOMPSON aged 12 years or thereabouts, sons of the said John THOMPSON." Thomas, s/o Mr. John THOMPSON of Bye Mill, was bap 1745, Stanton Drew. We suspect Mr. John is likely 1710 John (a bit older than named in the lease). Thomas was a widower when he married Mary (nee THOMPSON; d/o James/Elizabeth), 1772, Bitton. This couple had ten children; nine baptized in Publow and Pensford (1773-1792); first son, Thomas, baptized Bristol, Dec 25, 1779. Son Thomas m. Mary HIGGINS, 1802, and they had 11 children baptized in Publow. Thanks to the BAFHS Bristol Burgess CD, we learned that 1744/5 Thomas became a Bristol Burgess in 1767 (patron Thomas DYMOCK). In 1830 Thomas was named as patron for his son 1779 Thomas and the husbands of three daughters. This is how we learned that three THOMPSON siblings m three HIGGINS siblings. We are more certain about John's brother, William, bap 1695 Newland, who migrated to Bitton in the early 1700s with his wife Jane (nee EATON, of Blakeney, GLS). A cousin discovered his second marriage to Mary MAYNARD, 1743, Compton Dando. We have his 1754 will, his family's Bitton Monumental Inscriptions (MIs), other family wills, etc. William's daughter, Elizabeth (named in his will) m. James THOMPSON (b. abt 1722, Mecham, Surrey, per his 1768 Settlement Exam). They had eight children: two baptisms not yet found; one in Stanton Drew (1746/7); five in Bitton (1750-1760). Efforts to identify James have led to more speculations. We think we found his baptism, 4 July 1722, Beddington, Mitcham, Surrey, s/o John Thompson/Anne. Could this possibly be 'our' John/Anne nee COSTER? In Surrey re the copper mills? We have thus far been unable to find anything further in Surrey. The naming of a 12-year-old son James in the Pensford lease has fueled this theory. If correct, John's son, James m. brother William's daughter, Elizabeth. James/Elizabeth's son William THOMPSON m. Elizabeth (nee SUMPTION, d/o William/Sarah, maybe nee FOX), 1761, Bitton. Five of their children were baptized in Bitton (1763-1770) and we later discovered another five children baptized in Publow (1772-1784)! The Swinford mill closed in 1860. The Publow mill also closed at about this time and was converted to a farm, which remained in the family until a few years ago. This is the time when several members of the family migrated from Swinford and Publow to Selly Oak, nr B'ham. Many of this group worked at Elliott's Metals there. We would suggest checking the 1881 census, birthplace Bitton or Publow, to possibly identify other THOMPSON descendants in England and Wales. Most of the THOMPSONs in the 1851 census, Bitton, are identified and connected to the known families and we're making good progress identifying THOMPSONs in the Bitton Parish Records. We are progressing with the Publow/Pensford records, but have been distracted by trying to sort the Newland connections. In addition to one another . . .
Henry THOMPSON, b abt 1806 - 1813 Bruton (different ages in different censuses), is a mystery to us. He and his family are in the Publow area censuses, 1841 on, and are frequently neighbors of the known lines. However, we cannot find if or how he is connected to the other families.The discovery of his marriage revealed the name of his father, but still no ideas of any links to the other Bitton/Publow THOMPSONs. Henry THOMPSON (batchelor, labourer) m. Elizabeth SMITH (spinster) at St. Mary Redcliff on 10 Jun 1840. Both of full age, and of Temple Gate (very near to St. Mary’s). Fathers William THOMPSON (Smith) and John SMITH (Labourer). They both signed “mark of”. Surname SMITH is confirmed by ALL the children’s entries in BathBMD. David is descended from Thomas (1779 - 1857, Publow)/Mary nee HIGGINS. Members of his Publow family were part of the migration to Selly Oak, WOR (now WAR). John was a s/o 1803 Thomas/Elizabeth nee CLEMENT; Thomas s/o Thomas (1779 - 1857, Publow)/Mary nee HIGGINS. John & Abigail THOMPSON of Newland are my 7xG Grandparents, which I 'doubly own' as my 1805 Hannah THOMPSON was d/o cousins 1770 Sumption THOMPSON (s/o William/Elizabeth nee SUMPTION) and 1774 Nancy THOMPSON (d/o James [the Younger]/Rebecca nee BUTLER). Hannah m. William SMITH (b abt 1805, Rowde Wiltshire) 1826, Bitton. Children of Hanna/William were: abt 1831 John Clare SMITH (bap Swinford); abt 1832 Ann Maria SMITH; abt 1832 Sophia Thompson SMITH; abt 1835 Henry SMITH; abt 1838 Virtue Thompson SMITH; 1845 George SMITH; abt 1846 William SMITH; abt 1847 Thomas SMITH. (all but John Clare b Rowde, Wiltshire). My 1845 George SMITH m. Emma Louisa CLARK, 1870 Speenhamland Berks. Their son Frederick George SMITH (bap 1875 Calne, Wiltshire) m. Adeliza Mary LEE 1899 Asfordby Leicestershire. I don't yet know how, or even if, my THOMPSONs connect to the known Bitton/Publow families. They may well be from a totally different THOMPSON family. My 3x great-grandfather may have been Thomas THOMPSON, son of William and Elizabeth THOMPSON. He was born on 16th. February 1813 and baptized on 11th. June 1820 at Temple Church, Bristol. In 1851, the THOMPSON family was living at 7 Union Place in the parish of Temple, Bristol. Thomas THOMPSON was a 39-year-old labourer whose wife, Elizabeth, was a charwoman, aged 37. Children were Harriet, a servant, aged 17, and 1 year-old Robert. All the THOMPSONs were recorded as being born in Bristol. Harriet is thought to have been my 2x great-grandmother. I am descended from James (the younger) born 1743 of the THOMPSONs from Newland. My Gt Gt Grandfather William (born 1813) was the son of John and Elizabeth (nee MONK). From the 1860s William was living in Bristol with his wife Rachel (nee LEWIS; of Thomas, s/o Isaac/Sarah) and son William Henry (born 1846 Publow). After Rachel's death in 1873, William married Sabina COOK (25 years his junior) in 1874 and had three more children, Mary J, Alfred J, and Thomas W, all baptised at Temple Church, Bristol. I would be interested to hear from any descendents of these three children or any other interested party. Margaret's grandmother, Mary Thompson LEWIS (1849, Bitton - 1939, New Zealand) is the granddaughter of Mary THOMPSON (1773, Publow - aft 1851 census; a d/o James/Elizabeth) and second husband, Isaac LEWIS. James (the Elder)/Elizabeth are my 6XGgparents via three of their children: William/Elizabeth nee SUMPTION; James (the Younger, per his Settlement Agreement)/Rebecca nee BUTLER (Bitton families) and Mary/Thomas THOMPSON (Publow families). If some of our suspicions are proved correct, John/Abigail of Newland could be my 8XGgparents at least four times! My 3XGgmother, Mary Ann (d/o James/Hester, nee MEERE) m. her first cousin John MEERE. They were part of the family migration from Swinford, GLS to Selly Oak, WOR abt 1860. Several of her siblings and cousins are also included in this move. Martin is descended from James/Hester's son, Edmund THOMPSON (brother of Marsha's Mary Ann). Edmund was also part of the migration to Selly Oak. Edmund had five sons and over 30 grandchildren. James (the Younger)/Rebecca nee BUTLER's oldest daughter, Mary THOMPSON, m. John BUSH, 1793, Bitton. See the BUSH page for more details of this family. Nick is descended from William/Elizabeth nee SUMPTION. Their son, Coster (1768, Bitton - 1841, Publow), m. Honour FLOWER, 1803, Bitton. Coster/Honour had eight children in Publow.